The Cybex Balios M is an all-terrain reversible-seat stroller that has an one-hand compact fold and it weighs only 23 lbs. It has many features parents want in the stroller like huge canopy, roomy reversible seat, deep recline, large basket and adjustable leg rest. The all-terrain wheels together with all-wheel suspension provide a smooth ride. It’s great for long walks at the park, city streets or grocery shopping. You can also turn it into a stylish pram by replacing the seat with a carry cot or a travel system by replacing the seat with an infant car seat. The adjustable handle bar can accommodate taller and shorter parents. The one-hand fold is pretty compact and has a standing fold and auto lock. Aside from great features I also love the stylish frame design and combination of the white and black tires. BTW, this modern looking buggy was designed and made in Germany. This is almost a perfect stroller, but there are a few things I would improve. I would like to see a cover added for the mesh panel in the canopy. Also, it would be nice if the stroller worked with most popular car seats not just Cybex infant car seats. But, the main thing would be that one-hand fold that is really hard to get working. In fact this was the main complaint from other parents on how difficult the fold is. I hope Cybex updates it in the near future. BTW, there is a new stroller called Cybex Balios S which has a lot of similar features, but has a very deep flat recline suitable for a newborn unlike Balios M that keeps it’s ‘v’ shape so your child is kind of in a sitting position even when fully reclined. Check it out. -Huge canopy. This canopy is great! It has three large panels including a mesh zipped-in one that go down all the way to the bumper bar. Your child will get plenty of coverage. You can use the mesh panel instead of the peekaboo window to look at your child. The only thing I wish it had is the closure for the mesh to protect child from the wind and the sun. -Reversible seat. The seat is reversible so your child can face you or the world. It is 12.5″ wide with the 20″ seat back and a measurement of 22″ from the back of the seat to the top of the canopy. You will be happy to know that it has a very deep one-hand lever recline that goes to almost flat position. Despite the ‘v’ shaped seat, I think the recline is deep enough to put a newborn in. It can hold a child up to 55 lbs. Of course if you want to put a newborn into the seat, you will need to get an infant insert for additional support. To avoid tipping the stroller backwards when the seat is fully reclined, hang your diaper bag on the frame using stroller hooks. You can also use it to hang your water bottle, or shopping bags. -5-point harness. It has an adjustable padded 5-point harness with a center release buckle. Because the waist straps and the shoulder straps are connected, it’s very easy to lock the buckle. I like that white logo in the middle. -Adjustable handle bar. The telescoping handle bar goes from 37″ all the way up to 42″ from the ground. Shorter and taller parents will be comfortable. -Bumper bar. INCLUDED! This bumper bar is swing-away and can be easily removed. -Adjustable leg rest. The leg rest is adjustable so your little baby will be able to stretch his legs. -Huge basket. The basket is great! It’s large and very easy to access from the back. You can fit a lot of stuff in it including your largest diaper bag. For even more storage I would recommend getting an universal stroller organizer. That way you can take not only your coffee cup, but also a LOT of stuff including keys, phone, water, wallet, snacks, diapers, toys, and more. The amount of stuff it can fit is unbelievable. Look at how loaded this basket is! -All-terrain wheels. It rolls on four all-terrain wheels with 8″ in the front and 11.5″ wheels in the back. These wheels are made out of high-quality rubber and have foam filling so they never puncture or flatten. Now, I should probably mention that these are not the same as air-filled all-terrain wheels that you can use to go trail walking. These wheels are more designed for long walks at the park, city streets with uneven pavement, or some playground mulch. They are still much better than on many non all-terrain strollers. -All-wheel suspension. The all-wheel suspension together with large all-terrain wheels make the ride much smoother. -Flip-flop-friendly brake. I am always happy to see a flip-flop-friendly brake. No shoe scratches! -One-hand fold. The fold is three-step fold, but you can do it all with one hand and it has a standing fold and automatic lock. Since the stroller folds in half (one of my favorite folds), it becomes a very compact package for an all-terrain reversible seat stroller which are known for having a bulky fold. This is probably as compact as it can get. The folded dimensions are: 14.6″L x 22.4″W x 33″H. -No mesh window closure. There is a zipped-in mesh panel in the canopy that you can expose for larger coverage. This mesh can be also used as a peekaboo window. I wish there was an attached cover to protect the child from wind and the sun. -Works only with Cybex car seats. While you can convert Balios M into a travel system, it works only with Cybex infant car seats which I love, but they are not cheap. 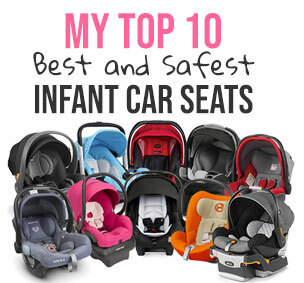 Here is my list of best car seats on today’s market. Here is a detailed video overview from Cybex. Here is a great video from Baby Gizmo. The Cybex has a 2-year warranty from the original date of purchase and you have to be the original owner. The Cybex Balios M comes in five colors: moon dust, grape juice, autumn gold, hot & spicy, and true blue. All come with a black frame. My favorite place to buy strollers and a lot of other baby items is Amazon. It usually has the lowest prices, free shipping, free returns and no sales tax. How great is that? You can get Cybex Balios M in one of the five beautiful colors for around $469 on Amazon (free shipping/free returns and no sales tax). It comes with a bumper bar only. All other accessories like cup holder or infant car seat adapter needs to be purchased separately. P.S. If you like my review, please click “like” button below. Between this Cybex Balios M and the Nuna Mixx, which direction would you go? I need a versatile stroller that I can easily travel (plane flights) with. Im a Cybex fan, the problem is that I cannot make my mind between the Balios M and the Priam! The Priam has this amazing fabric and the fluffy Lux seat. However, one would need a lot of space in the car to travel with it. The Balios seems easier to travel with but the fabric… I guess the question is, would the kid sweat much more sitting in the Balios than in the Priam? After reading through almost all of your recent reviews, I finally come down to two choices: the Cybex Balios M and the Mamas and Papas Armadillo Flip XT. Between those two, which one would you recommend in term of quality and versatility? Thanks SO much for all of your thoughtful reviews. I’m pregnant with my first child now and drowning in stroller indecision. I was set on the Nuna Mixx but then went to push it in a store and it was so heavy and tough to push even empty on flat indoor flooring (compared with the Uppababy Cruz) that I couldn’t imagine going up a hill with a toddler in it. So now I’m back to square 1. Do you have thoughts on how the Cybex Balios M compares with the Cruz push-ability? And does the fold work well with the seat facing both ways on the Balios? Like everyone I want to just have one stroller. I live in San Francisco (so very urban and hilly). I hardly ever drive and don’t have stairs to get into my apartment, but do frequently use public transport. So…I think my criteria are lightweight(ish), med-large basket, reversible seat, compatible with Pipa or Aton 2 (I want a Euro style car seat), easy push/feels light to push, easy fold that can fold with seat in either direction, a relatively compact fold, and durability. I had also wanted it to be a birth onward stroller without the need to buy the bassinet, but can compromise on that with the infant seat for the first three months if the Balios is otherwise the one. Other non-essential nice to haves would be easy curb pop, big canopy, removable/washable seat cover. Given all of that, do you have thoughts on if there are others I should consider, or if the Balios seems like a good option? I am worried the Stokke Scoot V2 will be hard to fold (many people say they hate the fold even though it is one hand) and the Valco Baby Snap Ultra fold seems really bad. Apologies for writing such a long note!! Just wanted to add that you can use car seat adapters for maxi cosy(pebble) car seat. I have tested it yesterday and it works! Great stroller in my opinion only negative is that hood is made from only one layer of material so it feels a bit weak and sunlight goes through specially on Autumn n Gold colour. How does the Balios M fair on cobbled streets? I’ve read mixed reviews… I live in Portugal and EVERY pavement / sidewalk in the country is cobbled. I have a 10 month old and I’ve been using the Orbit travel system…however my son has long outgrown the infant seat and therefore I’m in the market for a new stroller. I love the maneuverability of the Orbit and the compact size…I’m looking for something similar. Ideally, I’d like a reversible seat, all-terrain wheels, compact fold, stylish look, and reliable quality. I’d like to be able to close the stroller with the seat attached no matter which direction it’s facing. I’ve looked at Cybex Balios M, Mamas & Papas Armadillo Flip, and Uppababy Cruz. Please help! Which one would you recommend? I had a Cybex Balios M shipped to Australia from Germany as they don’t sell it in Oz, They sell the Cybex Iris but it is not all-terrain. It worked out to be the same price with the carry cot as the Iris. I am so happy with the pram! Many other prams were very heavy and I couldn’t lift off the ground let alone get into my car boot, The wheels don’t need to be pumped up and will never go flat which is wonderful as my husband and I spend alot of time at our lake house which gets very hot in summer, If we were to get a flat tier there would be no way to fix it until we returned to the city. over all the Cybex Balios looks great too! I am looking for a stroller or pushchair with all these mentioned features that you (and me) love from the Cybex Balios M All-Terrain Stroller, but with the difference that the back of the seat can be reclined respect to the bottom of the seat. I mean, the angle between the back and the bottom of the seat is not fixed. I don’t need a carrycot neither a travel system because my baby is already 14 months old. Could you recommend me a model with these characteristics? Folding with the seat included. Hello, Thank you for your excellent reviews that I have been referring to often during my (everlasting) stroller search. I need a stroller with a compact fold that can close with the seat parent facing. I’ve narrowed it down to the Balios and the Armadillo Flip XT 2. What would you recommend? Or is there something else I should be looking at? Is this stroller padded on sitting part or only canvas like quinny zapp? Hi there, I am Susan! I am a mother of a beautiful baby girl Sophia and a STROLLER ADDICT! You can also find me on Google+ and Facebook. Have a question or comment? Drop me a note.